In Part One of Ten Tasty Tuna Salad Sandwiches, I wrote about some of my favorite “cool classics” where the tuna is served cold on some sort of tasty bread. 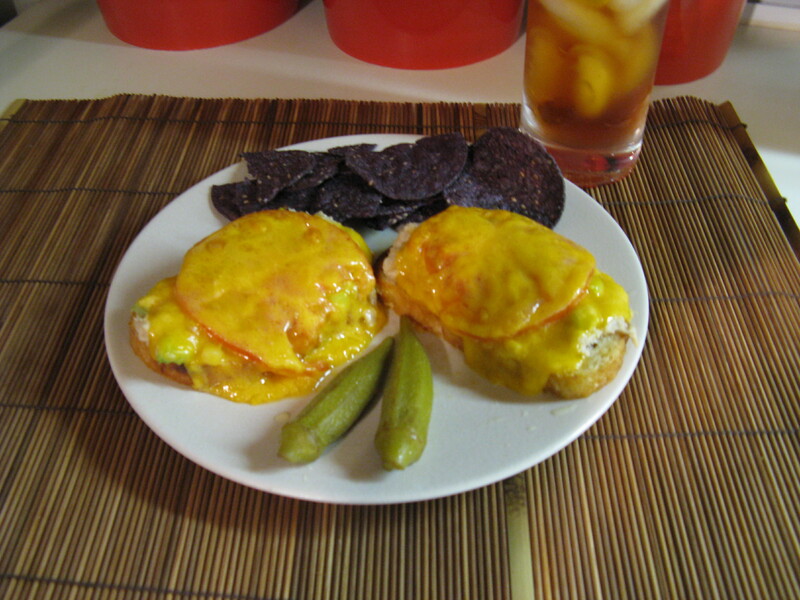 The focus of Part Two is on tuna melts, where the tuna is topped with some sort of cheese (one of the world’s wonder foods as far as I’m concerned) and heated. As I mentioned in Part One, I am picky about my tuna salad and compare everything to my grandfather’s concoction (click here for his recipe.) All of these melts start with a great base of tuna salad that I would happily eat cold. 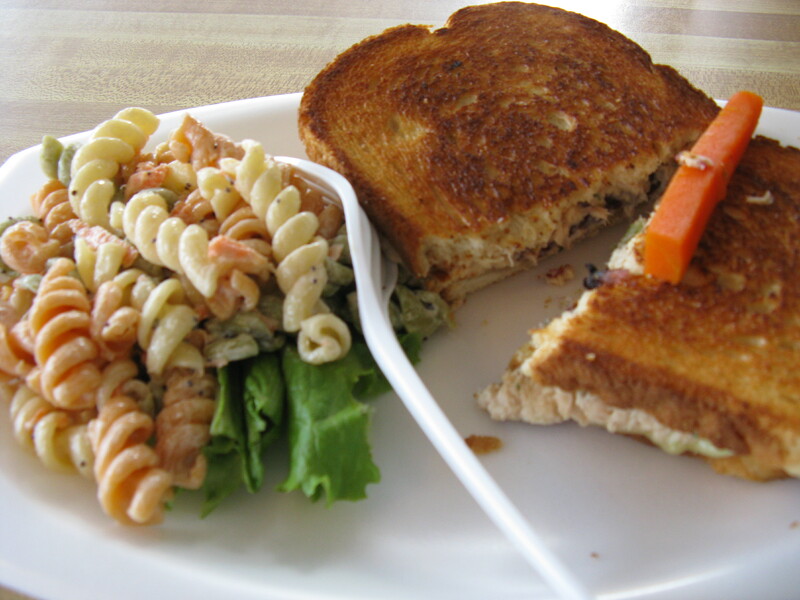 The Seaboard Café is a great lunch destination located in Logan Trading Company, right off of Peace Street near Peace College. Opened Monday-Saturday from 11:00-2:30, it does a great business and the line is often quite long, but moves at a steady pace. I order the Grilled Tuna Salad, Swiss & Cranberries Sandwich for $7.50, and really didn’t know what to expect with the cranberries. 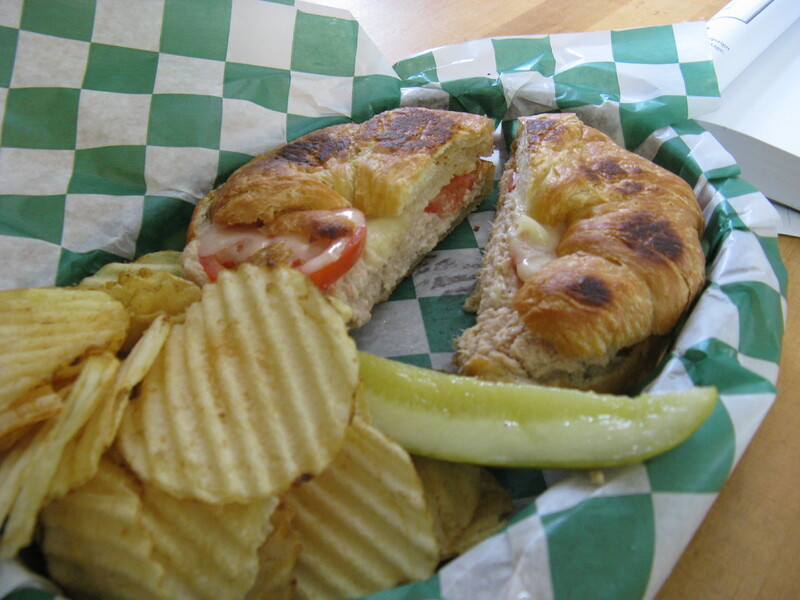 OMG – this is one of my favorite tuna melts ever! It comes on grilled sourdough bread and is a perfect mix of sweet and savory. It is served with raspberry-Dijon pasta salad which is tasty and a pickled carrot (they sell these delicious little things by the pound). I don’t go as often as I’d like to mainly because I always wind up buying too much stuff at Logan’s and across the street at Seaboard Wine. 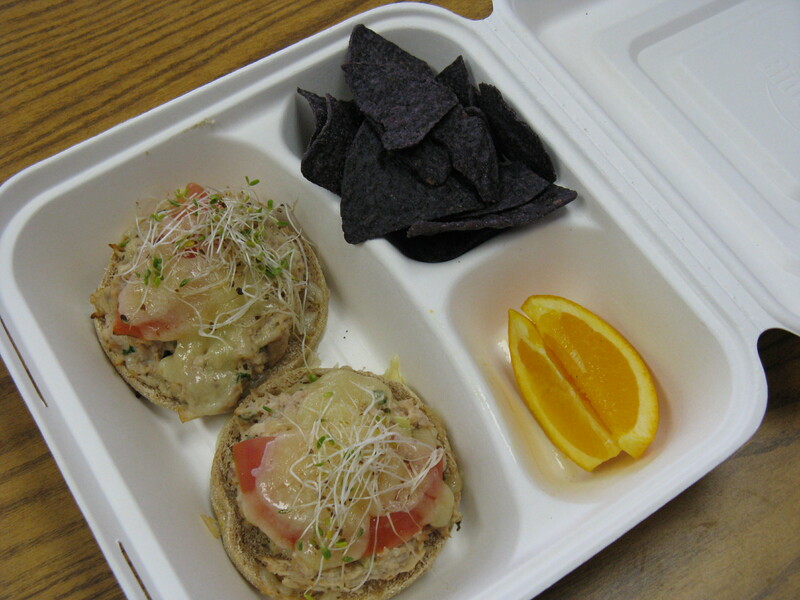 I tried the albacore tuna melt, which consists of tuna salad on an open-faced English muffin with tomato, Swiss cheese and sprouts, heated. The tuna salad was very good with onion, celery, mayo and parsley. $8.99, with your choice of veggie chips or blue chips. This place recently opened and is run by the folks who own Harmony Farms, which is located a few doors down. It is Raleigh’s first totally organic and natural café, according to its website. 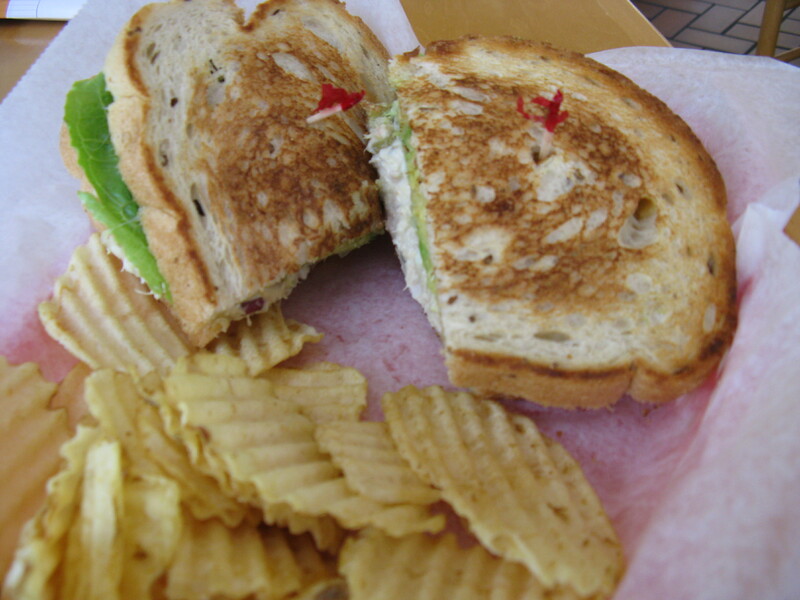 Café Harmony is located in the strip mall on the corner of Millbrook and Creedmoor Roads. I have also tried the smoky black bean burger there, which is awesome and will be featured in an upcoming blog. I hope this place makes it, and judging by the lunch crowds, it should. I knew I had to try the tuna salad at Sunflowers, one of my favorite sandwich shops anywhere! And I was not disappointed. The tuna salad had pickle relish, eggs, mayonnaise and onions in it, and even though I normally steer clear of the relish and eggs in my tuna, this salad was quite good and creamy. It came grilled on rye bread with avocado, cheddar cheese, romaine lettuce, tomatoes, mayo and house mustard. This was a great combination of flavors – I especially liked the cheddar and avocado. 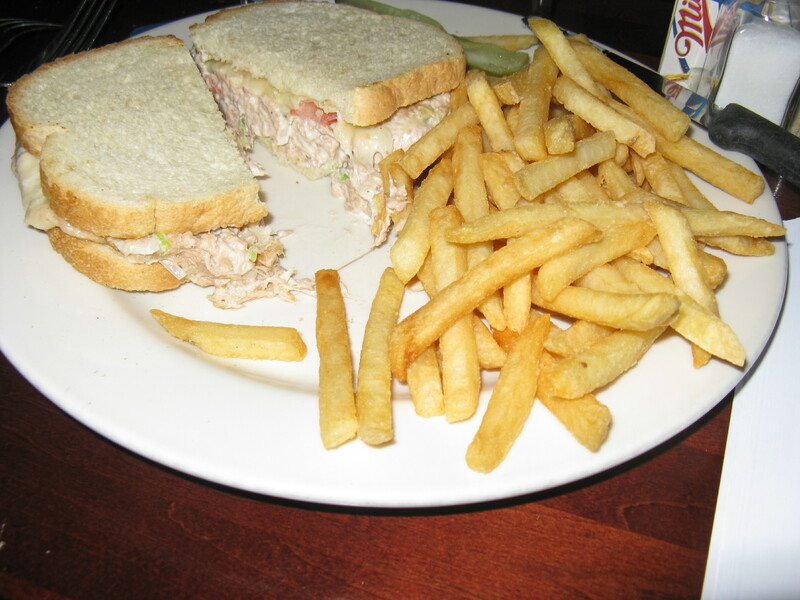 The tuna melt comes with a side of chips for $6.50. This tuna salad is for the purist – it’s basically white albacore mixed with mayonnaise. It was very creamy, but did need some salt and pepper. It was served on a croissant with melted Swiss and tomato. I thought they toasted it a tad bit too much, but it was still good. It came with chips and a pickle for $7.50. Service was good and friendly. Serendipity is a quaint little place in downtown Cary. I remember going there in the mid-80s, and the food is still good. So ends Ten Tasty Tuna Salad Sandwiches, parts 1 & 2. Be sure to check out my grandfather’s recipe if you just don’t feel like going out. And please send me your favorites if they aren’t on my list! This entry was posted in Pescatarian, Raleigh's Best, Restaurant Reviews and tagged eat drink and be merry, food blog, Harmony Cafe tuna melt review, Kel's cafe, Kelley Chisholm blog, North Ridge Pub tuna melt review, pescatarian meals, Raleigh food blog, Seaboard Cafe tuna melt review, Serendipity Gourment Deli tuna melt review, Sunflowers Cafe tuna melt review, tuna fish salad, tuna fish salad recipes, tuna melts, tuna recipes, tuna salad, tuna salad sandwiches. Bookmark the permalink.